Agastache rugosa or Korean Mint is a plant native to East Asia. It is found in Korea, China, Japan, Taiwan, and Vietnam. The other common names of the plant include Blue Licorice, Purple Giant Hyssop, Huo Xiang, and Chinese Patchoul. Agastache rugosa belongs to Lamiaceae or Mint family. It is a perennial medicinal herb. Like other members of its family such as basil, peppermint, sage, Korean mint is also aromatic, and medicinally useful. Korean mint or wrinkled giant hyssop acquired its Latin name from the rugose, or wrinkled, leaves. 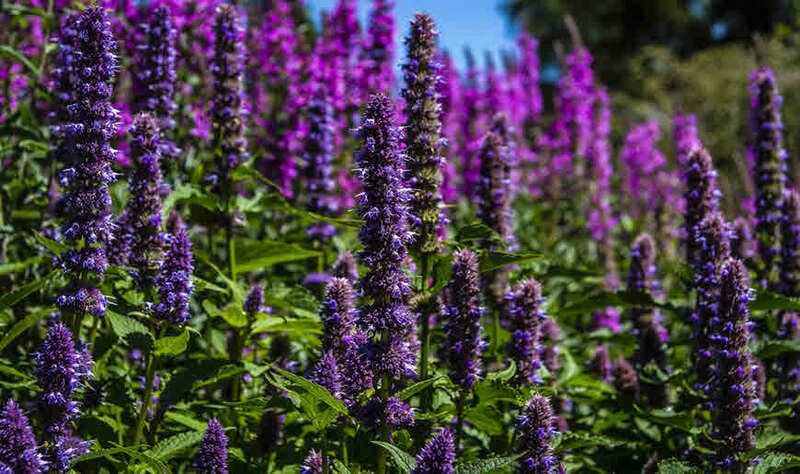 Agastache is derived from the Greek roots agan = very much, and Stachys = spike, referring to the numerous flower spikes tightly packed with whorls of brightly colored violet flowers. The flowers are fragrant, and attract bees. Agastache species need little more than partly shaded to sunny, well-drained, acid to near neutral soil. Korean Mint is pungent (acrid), and is slightly warm with the channel affiliations entering spleen, stomach, and lung. Pharmacological studies confirm its antiviral, antimicrobial, antioxidant, cardiovascular, and anti-inflammatory activities. In Korean Mint essential oil extracted from the leaves, the principal constituent is commonly 20 to 96 percent estragole with 0 to 45 percent isomenthone, and 4 to 12 percent limonene. Agastache rugosa Plant is a PERENNIAL growing to 1 m (3ft 3in) by 0.6 m (2ft). It is 8 hardy to zone (UK) & 7-10 (USDA hardiness), and is not frost tender. Korean mint bears purple or rose-violet flowers. The species is quite similar to anise hyssop, differing in having a slightly coarser habit, rougher leaves, and paler flowers. Korean mint is not a true mint. The flowering takes place from July to September, and the seeds ripen in September. The plant is grown in part shade to full sun as edges of shaded areas, mid-section of borders, bee plant. The plant does best in dry, well-drained soil, and prefers soil rich in organic matter, and neutral pH. The seeds (tiny nuts, or nutlets) are sown in spring. The seeds may be sown in the greenhouse with transplants in six to eight weeks. The seed usually germinates in 1 – 3 months at 13°c. Plant clumps generally last two to three years, becoming very woody at the base, and eventually dying out. The species are hermaphrodite (has both male, and female organs), and are pollinated by Bees. The plant is self-fertile. In Traditional Chinese, and Japanese Medicine, the whole plant is used for medicinal purpose. Korean Mint, is said to relieve nausea, and vomiting, and cure fungal infections. It is pungent (acrid), and slightly warm, and works on spleen, stomach, and lung. The essential oil is used against fever, headache, stomach pain, morning sickness, and gastrointestinal disorders. Korean Mint essential oil is anti-fungal against Trichophyton species that cause tinea infections It is also found to selectively inhibit the proliferation of human cancer cells in vitro. Agastache rugosa leaves have strong anise-like fragrance, and are eaten raw or cooked. The leaves can be dried, and sprinkled on salad to add flavor. Agastache rugosa leaves are used as a substitute for French tarragon or brewed into a tea, and the flowers mixed in mesclun salads. The tea is warming in nature, and helps in chest congestion, diarrhea, headache, dampness within the digestive system, poor appetite, and digestion, morning sickness, abdominal bloating, indigestion, nausea, vomiting, and other digestive problems. The tea is considered antibacterial, antifungal, aromatic, carminative, diaphoretic, febrifuge, and stomachic. 4.5-9 g herb or 1-3 g herb concentrate is used for medicinal purpose. The plant is considered safe when used in the recommended dosage.